By the time a man was truly wise, he was old and feeble—until now. A revolutionary technique developed by Dr. Katsu Lang of the Asteroid Belt has changed all that; students can actually be innoculated [sic] with “memory molecules” and given a lifetime of knowledge in the same length of time as ordinary schooling. that’s why the brightest youngsters from all over the solar system vie for entrance to the Astro Technology School on Earth. At the head of his class at AT is Stan Dustin, son of the hero of the Asteroid Belt’s first triumphant battle for independence. When he learns that he is being groomed for a career in Earth’s hated militia Stan escapes to the Belt, where he learns the frightening truth about the memory injections and the side effects Earth has so carefully cultivated. The struggle for the Belt’s independence is far from over—and of all the brilliant young officers from the AT school, only Stan has full control over his own will. Earth plans that the second battle with the upstart Belters will go very differently from the first—but Earth reckons without Stan Dustin, and the courage of men who fight for a world they love. Could that back cover synopsis be any longer? Jesus, it’s like 200 words. 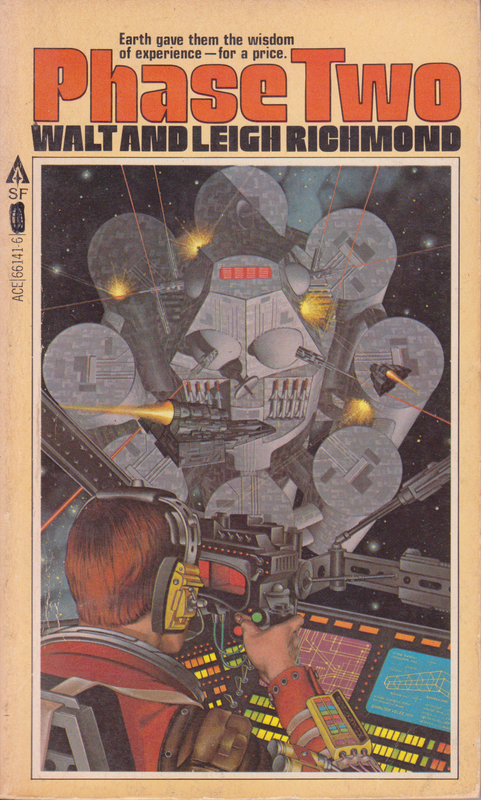 It seems like a lot of my reviews seem to follow the pattern of “This book was dumb or boring or just bad, but it had a good premise or a couple of germs of good ideas in it.” It’s the reason I really like reading and reviewing old pulp science fiction. Looking for the redeeming features in an otherwise dreck novel, so to speak. Well, folks, this week we’ve got a real doozy, then. See, the thing about Phase Two is that yes, it was boring. Yes, it was not especially well written. And yes, I threw it across the room when I finished with it. But those little gems of good ideas? Those shining moments of genius? There were SO MANY. It’s like every feature of the plot of this book except for the actual point of the book was brilliant. I feel like maybe all the effort went into the worldbuilding and into actual research into things like physics and engineering. This was fairly hard sci-fi, really, and the homework shows. That’s something I can appreciate, you know? On the other hand, though, we’ve got a main character who isn’t so much useless (there’s a shock) as he is boring, although really I think that’s a problem of the plot and not of the character. There just isn’t anything for this guy to do. Never once in this novel did I feel like there was any danger for the main character and for his comrades. There was no dramatic tension at all to me. But wait, I forgot to talk about the cover! Look at it! Star Wars, dudes and dudettes! I bet that guy is going to fly down a trench to find a small thermal exhaust port just below the main port. Also he’s looking through a ViewFinder until Obi-Wan tells him to trust himself. Even that guy’s uniform color, what you can see of it on his arm and back, anyway, is basically the same as Luke’s at the end of Star Wars. It’s pretty blatant. The book came out two years after Star Wars, as well, so I don’t think anybody can rightfully claim it was an accident. Way to try to mislead me into buying this book, publisher. So was the plot a Star Wars ripoff? It really wasn’t. But this is a bit of history that I think is pretty interesting. So this book was ostensibly written by Walt and Leigh Richmond. Husband and wife team. Nothing wrong with that. This book, however, was originally called Phoenix Ship, which was written in 1969 and rewritten or at least revised by Leigh Richmond, by herself, after Walt died in 1977. So that leaves us with an interesting question: how much of this is her fault? Or could it be that she actually made it better than it would have been? That filled me with an “uh-oh” feeling. Could it very well be that this would turn into another East of Danger? That’s not too bad, then, is it? Not like some kind of wacky quasi-religion, more like a philosophy. A non-profit advocating a certain rugged individualism and free-thinking attitude. Okay, I guess I can dig that to a certain point. This book definitely tried to make that its theme. It also failed, not because it forgot to bring it up or anything. Quite the opposite. Or…well…I’m not sure if it’s the opposite. Here’s what happened: the book didn’t bring up anything of the sort until the last ten pages, at which point a soliloquy happens that straight up tells us that that was the theme of the book. You know, I’m going to say this book has a lot in common with Robert A. Heinlein’s work. Similar philosophies similarly delivered. But here’s the thing: Heinlein, even at his most didactic and preachy, at least put an interesting idea in the background of a book. Phase Two, however, has the most trite damn plot you can imagine. Maybe it was more original back then, but somehow I doubt it. So here’s our hero, Stanley Thomas Arthur Reginald Dustin. That is seriously his whole real name. And then you think about it and you go “Oh my god his first four names spell STAR.” And at then about two pages after you figured it out for yourself and debated dropping this one off in a free book bin somewhere, the book tells you how awesome that is. Stan has a lot of issues with his dad but idolizes his uncle Trevor, who is currently leading a rebellion in the Asteroid Belt against the Earth. The rebellion is pretty cool, actually. The Belters use a lot of clever ways to beat the Earth fleet, which is supposed to be huge and shiny and new and nigh-invulnerable. Earth Fleet has capital ships while the Belters basically use one-man mining vessels as fighters. Their grand scheme, which works, is to basically accelerate toward the cap ships and then turn around and burn hard, using their engines to burn big holes in the Earth Fleet ships. They win handily, although Trevor Dustin dies in the attack. During all this, Stan is at school. It’s supposed to be a special school, and even for that special school Stan goes through some weird stuff. He’s not actually taught anything so much as quizzed on things he’s never seen before. He does very well at it. Finally it’s revealed that he’s a test subject for a new learning process that transfers the memories of older, more learned men into younger men who have more time to do stuff with it. Basically Stan hasn’t been learning things so much as learning how to call on that information that was already in his head. Stan gets mad when he learns this and flees to the Belt with the intention of joining the rebellion. He does this, meets up with some people, some other people try to kill him, and he comes up with a plan to get Earth off the backs of the Belters. Somewhere around this point he learns that his “Uncle” Trevor is actually his dad and that he left him a lot of money. Honestly it went really quickly but it had a lot of asides. The asides were a lot more interesting than the main plot, though. I’ll get to those in a minute. Oh, and the bit about finding out that Uncle Trevor is really Dad? It was supposed to be a surprise. The back of the book spoiled it, though. The plot resolves when Stan comes up with a radical new kind of spaceship that is made out of a hollowed out asteroid. Actually I think the ship, Phoenix, was already in production, it’s just that Stan uses his implanted smarts to come up with a new drive for it that is really fast. The asteroid itself helps with that in a way that I really enjoyed seeing happen. See, Earth Fleet 2.0 decides that it can’t allow this kind of thing to go on, so they launch some attack ships at the Phoenix. Something about its metal exterior, though, gives the Fleet a big surprise. Instead of just burning holes in the Phoenix until it explodes, the outer metallic surface ablates, melts, flies around, and then sticks to the offending ships before resolidifying into solid metal, rendering them useless. The ship is big, so the Earth Fleet hits it with everything its got. Phoenix takes no damage and defeats the entire fleet without firing a shot. Stan calls up the commander of the fleet and this is where the preaching begins. Stan basically says that the people of Earth have gotten soft and over-reliant on having other people do the thinking for them. The difference between Earthmen and Belters is that Belters are individualists. The Belt will no longer tolerate any meddling from Earth. They are no man’s servants. They have already renamed Ceres to Ayn Rand. I made that last one up. To back this ultimatum up, Stan points out that since Phoenix is so fast and so powerful, he could easily just fly it over to Earth and swoop down into the atmosphere at full speed. The shock waves would blow up lots of things and render the ground below them useless. Also the engine would do a lot of radiation damage. He has a weapon of mass destruction, and while he doesn’t want to use it, he will if he has to. The book ends with Stan saying that the only way for mankind to be free is to venture out into the stars. He’s come up with a revolutionary new ship drive that will allow just that. In fact, it’s not even a ship drive. It’s a planet drive. Some years down the line, he thinks he’ll be able to strap this thing to a small moon or something and then a whole colony of humans can set out for the stars. He also points out that other species in this universe are doing this already, and that’s what quasars are. So really that was the plot. But I mentioned the parts of the book that were good and weren’t plot, so here we go. Belters measure distance around the belt in terms of months and days, not because it takes that long to traverse those distances, but because they devised a system based on the movement of the Earth. Picture the solar system as a giant clock, except instead of a clock it’s like a round calendar or something. Point A is “January” because the Earth is roughly lined up with that part of the belt when it’s in January. So point B somewhere down the line is “March.” And so forth all the way around. Similarly, because of orbital mechanics and stuff, it’s easier to point out the positions of the various bodies of the Solar System by what sign of the zodiac they’re in. This is not to say the book endorses astrology, it’s just a useful designation. Capital ships and space stations are shielded by a layer of water built into the hull of the ship. (Note: this is actually a proposed thing). The shielding is there to protect the crew and passengers from space radiation, but you can also use it for other stuff like…water. In the case of this book, it’s also an oxygen recycling system because the water has a bunch of plants in it. Also fish. And the walls are clear so at any point you’re basically surrounded by a wall of aquarium. In space. Those are the things I can remember off the top of my head. And that’s some pretty cool stuff! Also I mentioned the bit about the ship made of an asteroid. That was neat too. Even the “memory molecule” learning stuff was neat enough in concept, even if I’m not entirely sure it makes any sense. It was at least well-thought-out in its own right. The problem with all this is that very little of that neat stuff was the point of the book. Even the memory transplantation bit, which you’d think would basically be the whole point of the book, was little more than a starting point. After a while I guess it’s taken for granted that Stan can figure stuff out and that he’s super smart because he got tested on. He comes up with a lot of the ideas in this book, so at least he’s not totally useless, but there wasn’t much you could call interesting about him. For a book with so much going for it, I believe it forgot to be in any way entertaining. Never once did Stan feel threatened or confused or vulnerable. I guess it’s worth pointing out that this is another book without a lot of emotion in it. I never felt anything beyond “Oh god I’m only halfway through.” And that’s a bad sign. Authors, if you can’t make me interested, at least make me mad. That’s all I ask. Wait, so what was “the frightening truth about the memory injections and the side effects Earth has so carefully cultivated”? Did that part of the plot just not happen? For the most part, no. I think there was a bit about how some people got turned into “robots” but there was no real explanation of what that meant other than Stan was special because he did not get turned into a robot.